A supremely smooth cup with heavy body, very low acidity, aromas of sandalwood and flavors of dark chocolate, nut and earth. We suggest preparing this coffee in the press pot, stovetop Moka pot or as an espresso. Monsooning is a processing method unique to the South-West coast of India in which green coffee is exposed to the high humidity conditions present during the monsoon season. Throughout this process, the coffee undergoes complex changes and new aromas and flavors are unveiled. 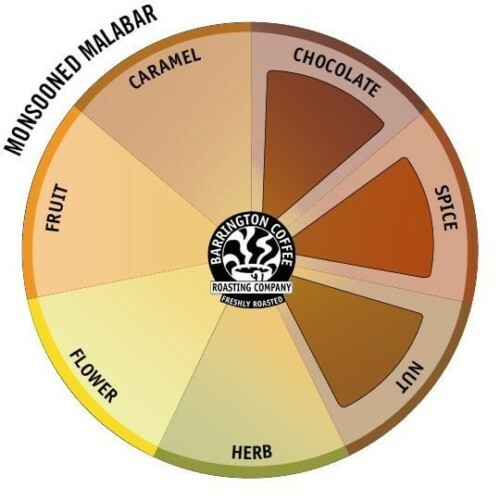 Monsooned Malabar is making it a Geographical Identification (GI) Certified Product. This Monsoon Malabar AA Super Grade requires more attention to its processing than any other coffee in the world. 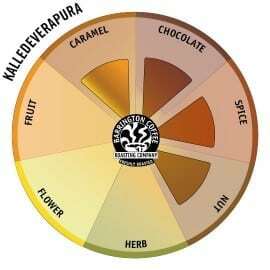 And this is not just any monsooned coffee from Malabar, this is Aspinwall Monsooned Malabar AA Super Grade prepared especially for us through our work with Josuma Coffee Company. The AA Super grade represents an additional level of sorting that is not subjected to straight AA. The process begins by selecting AA grade coffee cherry which is spread out on concrete patios and sun dried. The coffee is cured and sorted and stored until the onset of the monsoon season. When the monsoon hits from June through September, the seeds are spread out beneath tile roofed, open walled structures where they are raked at regular intervals. When exposed to the high atmospheric humidity, the seeds absorb the moisture and expand. The seeds are vigilantly raked and turned to prevent mold formation and are bagged in windrows. The spreading and bagging is repeated up to three times until the coffee beans acquire a golden hue. Prior to export the seeds are color sorted through a super high tech Spectrum color analyzer and then they are further hand sorted through a process referred to as “garbeling”. The entire process comprises many months of devoted attention. We have worked closely with this coffee since its inception in the mid 1990’s. To see photographs and learn more about the fascinating process of creating Monsooned Malabar, please visit our gallery. Recently Chef David Chang of Momofuku fame featured a story about Aspinwall Monsooned Malabar in his publication Lucky Peach . 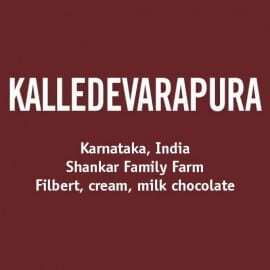 We are offering the Monsoon Malabar alongside with the Kalledevarapura in our India Tasting Pair for $30.00 and in the India Sampler alongside the Kalledevarapura and the Devon 9 for $44.00.